Can my child request to be with friends? Is Mooredale open on statutory holidays? Is the swimming time safe for my 4 or 5 year old? How do I know what swim level my child should be in? What are the camp fees and what does it include? Do I have to be a Mooredale member for my child to take part in the camp? What activities can my child expect to take part in? What are your counsellor to camper ratios? 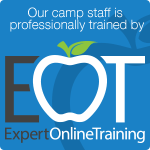 How are the camp staff trained to take care of children? How are students selected to work at camp? If I register for camp and my summer plans change, can I switch sessions? Can I visit camp before hand? Our camp operates with a two-week session structure, with 4 sessions during the summer. However, campers can select 1 week options and mix and match the weeks that suits their summer schedule. Our morning drop-off time is between 8:15 and 8:45 am. Afternoon pickup is between 3:30 and 4 pm. Yes! This year we are offering both a before camp and an after camp program. Before camp care will be from 7:30 - 8:15 am. The cost is $60/week or $15/daily. Yes! We believe camp is better with a friend, and we do our best to ensure friends are in the same cabin group. There is a place on the registration form to indicate friend requests, and you can always contact the office if a friend decides to come to camp after you have registered. No. We are closed for the national holidays. In 2019 there will be no camp on Monday July 1st or Monday August 5th. After 15 minutes the pool is cleared and attendance is taken. Swimming resumes only when all campers are accounted for. To swim in the deep end, campers must pass a deep end test and be at least in swimming Level 5. An identifying bracelet must be worn by campers swimming in the deep end. A few weeks before camp, you will be contacted to provide your child's swim level. If you don't know for sure, we have a short questionnaire that helps determine approximately what level they should be placed in. On the first day of camp, every child will be assessed to ensure they are in the correct swim level, and they will be switched to the right level if needed. Specialty streams are the opportunity for our Intermediate and Senior campers to take part in specialty programs that run for 1/2 of the camp day - usually in the afternoons after lunch from 1 pm until Round-Up at 3:10 pm. Camp staff accompany campers and participate in the specialty and certified instructors or coaches lead the activity area. Specialty streams for Inters are voluntary. Senior campers must choose a specialty stream to take part in. For the majority of the programs, campers take part in the regular morning programs, swim lessons, and the camp recreational swim times. 8:15 – 8:45: Camper drop-off. The staff team gathers on the lawn behind the Main House to wait for the families and campers to arrive. Parents have the option each day of communicating directly with their child’s counsellor or with any of the camp leadership staff during this time. 8:45 – 9: Mooredale Morning Madness. This is a time for camp songs, announcements and games - making sure we start every day with some action and a smile. 9 – 11:30: Morning programs & Red Cross swim instruction. Campers rotate through 30 minute activity times planned by the program staff. It is during this time that Red Cross instruction takes place for each camper**. At the appropriate time your campers will be taken to the pool (which is on our property) for their instruction by a camp staff member. After, they will be returned to their group to rejoin the activity schedule. **Some Senior camp specialty options do no include swim instruction, including Overnight Camping and Competitive Swimming. 11:30 – 12: All-camp recreational swim. One of our special features is the opportunity for each camper to swim twice a day. This ½ hour swim time is simply for fun and cooling off on those warm summer days. All junior campers (ages 4 & 5) wear life jackets during this swim time regardless of their swim level. Only campers who complete a deep end test and are in Level 5 and above are able to swim in the deep end. Camp counsellors and leadership staff are required to be in the pool for the entire time and are expected to be engaged with their campers. A local catering company, The Lunch Mom, provides lunch and both morning and afternoon snacks for all campers. The meals are kid friendly and served buffet style with plates and cutlery. Each lunch includes a main dish along with salad and fresh veggies. Dietary accommodations can be made upon request. 12:45 – 1: Mooredale Mealtime Madness. Another fun time where a small group of counsellors are put through a series of daily challenges (like the Survivor TV show) to determine a winner for the session. Campers cheer on their favourite contestants. Similar to the morning, cabin groups rotate through different specialty activities including arts and crafts, drama and music, athletics, and cooking. Intermediate age and older take part in archery and tennis lessons at Rosedale Tennis Club. At this time of the day, we understand our campers - especially the younger ones - can be a little tired, and the afternoon sun can be very hot so we make sure the activities are suitable for those conditions. 3 – 3:30. Round Up. The entire camp gathers for one last time to sing songs, watch skits, have ‘Campers of the Day’ recognized after being nominated by their counsellors, and the Golden Broom presented to the cabin with the cleanest homeroom area. At the end of Round Up campers move to the front of Rosedale Public School. 3:30 – 4. Camper pick-up. Again, this is a time where parents can, if they choose, to communicate with the counsellor about how the day went. After Camp Care is available at a cost of $160/session or $20/day. You can pre-register for after camp care, or notify us as late as 2:30 pm on the day you need it. A full list of session prices, including one week options and specialty streams for Intermediates and Seniors, can be found here. Camp fees include camp activities, red cross swim lessons, daily hot lunch plus morning and afternoon snack, field trips and a camp t-shirt. Camp fees do not include after camp care or after camp programs such as French and piano lessons. Yes, every camp participant must be part of a Mooredale Family membership. Family Membership is only $125/year, and allows your family to take part in any of our other programs for the next 12 month period. Camp activities for junior campers include sport/athletic based games, co-operative games, arts and crafts, music, cooking, drama, story time and playground time. In addition we have weekly theme dress-up days which give campers a chance to dress up and take part in theme-based activities. Every Thursday during the summer will either consist of a field trip to a local venue, or a camp-wide special event. For example, in the past we visited Ripley’s Aquarium, Black Creek Pioneer Village and the Science Center as part of our field trips. Special events have included Colour Wars, Family Game Night, and Mad Scientist Day. We are located at 146 Crescent Road. (on the northeast corner of Mt. Pleasant Road and Crescent Road). The #82 Rosedale TTC Bus Route stops in front of our property. We operate out of a historic mansion and are fortunate to have a full sized pool on our property, along with a fenced in playground. Rosedale Public School is located across the road and we have the ability to use their outdoor space for activities as well. For parents dropping their children off by vehicle, we have free parking on site. Parents are responsible for transporting children to and from camp. We have free parking available on site for those that are driving. For field trips we charter a bus company such as First Student for our transportation needs. Some Senior Camp day trips may use the TTC to reach their locations. During the day, cabins are grouped together to form "Traveling Groups" and assistant counsellors and volunteers are added to support the counsellors, resulting in our ratios usually being cut in half. Our Camp Counsellors are high school (Grade 11 & 12) and university students and required to have Standard First Aid certification and AODA training. In addition, we have Assistant Counsellors (15-16yrs old) hired to join a group and provide extra support to our counsellors while learning the tools of the trade. When considering our leadership team of Section Directors and program staff, overall our camper/supervision ration is about 1:3. All staff are required to take part in a week long training session before the start of camp, and must complete a course of 20+ online training videos. All counsellors and leadership staff take part in a comprehensive week of staff training before the season starts. In addition, many of our counsellors are former Mooredale campers themselves eager to pass on their own positive experiences. We posted an in-depth article on our hiring process on our camp blog, the Big Blue Tarp. You can read it here! Each student submits a written application and is required to take part in an in person interview with the Camp Director or Assistant Director. After references are checked, successful candidates are offered a position and then complete their training before camp starts. You can register online or, you can send in a paper registration by email, fax or in person to our office. An electronic copy of our registration form will be available for download, and this document outlines the prices and dates of each session. Yes, we will do what we can to change your session - as long as the one you want to switch to still has availability. As soon as you know your plans have changed contact the camp office directly. We realize that life happens and sometimes you have to change your plans. Up until May 1st, your camp fees will be refunded fully, less a $100 deposit. After May 1st, refund requests for cancellations will be evaluated on a case by case basis. Between May 1st and June 15th, a minimum of $100 per week would not be refunded. After June 15th, a maximum of 50% of camp fees would be returned. Yes, you are welcome to contact the office to arrange a personal tour with the Camp Director. Our facilities are not large so plan on approximately 20 minutes to complete a tour.